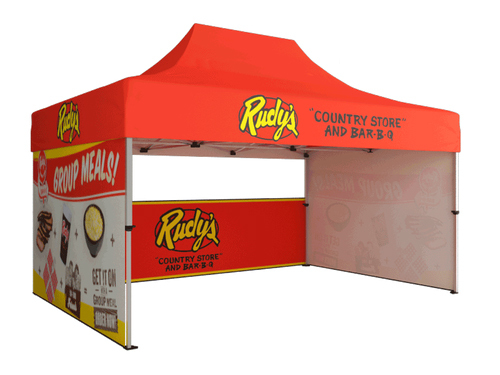 10’ Trade show booths are the most popular method of creating an instant graphic backdrop to promote your products and services. We’ve hand selected a variety of pop up displays, trade show exhibits and portable backdrops to cure any 10x10 trade show environment, all backed by our Lifetime Warranty and price match guarantee! A Graphic display attracts 74% more attention than your traditional velcro display. So step up your game and showcase in style to give your company the branding it deserves with an array of portable trade show displays, portable exhibits, pop up displays, retractable banner stands, and 10x10 trade show booths that convert sales! Exhibiting at a trade show has many benefits. Whether it’s getting visibility, or credibility – presenting at a trade show gives you a powerful platform for meeting new prospective customers. In some cases, your very presence at a trade show informs the industry that you’re a reliable partner and brand. Because of the cost of going to trade shows, many brands put off exhibiting. Developing a trade show exhibit, training staff members, and traveling to the event is an expensive process. In some cases, some brands “cut corners,” beginning with their trade show booth. Here’s what you need to know, before purchasing a trade show booth. What are the goals you’d like to accomplish at the trade show? Is it meeting people, closing sales, or getting names + email addresses for your mailing list? Depending on your business objective, or what product/service you want to promote – you’ll want to decide what type of trade show booth will give you the highest ROI. Both the type of trade show booth you get, and design, can greatly impact your presence at trade shows, and what type of response you get from prospective consumers. It’s critical that you make sure your trade show booth is highly publicized, before the trade show begins. Often, it helps to start a hype campaign the weeks preceding the actual show itself. If you build enough momentum and anticipation, you’ll see a flood of prospective and existing customers visiting your booth. It’s important you design/select a trade show booth that will be able to accommodate all of these people. What is your company’s unique benefits? Trade show booths not only communicate important information about your brand, they also emphasize a unique benefit your company offers. More than simply telling your prospects who your company is, and what product/services you offer – a good trade show booth will emphasize why consumers should choose you over the competition. Regardless of what your main selling point is, it’s critical your trade show booth emphasizes this feature and attracts prospective clients.